Apparently when the Discovery Channel broadcasts ‘Shark Week’ which this year starts on August the 2nd visits to Florida beaches decline dramatically. Presumably, the Discovery’s programming makes the waters no less safe (I hope). However, after watching a week of kicking legs seen from a shark’s eye perspective from below, the idea of shark attack is refreshed in our minds and we choose not to offer ourselves as bait. This phenomenon is known in decision-making as the availability heuristic or bias – a heuristic is a rule-of-thumb we apply in situations of uncertainty. What is happening is we assume that events that are easily recalled due to recency (i.e. happened last week) or that are particularly dramatic (i.e. being eaten) are more likely to occur than they otherwise do in practice. Although there is always a chance I suppose as Florida is the shark attack capital of the world and overall the USA has more shark attacks than any other country in the world due to the large amount of sharks per se, as well as being the home of the worlds three most dangerous species of shark: the Bull, Tiger and Great White as well as the culture of surfing and water sports around its shores which puts lots of opportunity their way! Although you will be glad to hear that although shark attacks are more common in the US there are fewer fatalities than in Australia – presumably the yanks can take their foot in their hand and get the hell out of the water more quickly! The sunnier side of the availability heuristic is the lottery and the question should you invest $2 a day in the bank (pre credit crunch) or use it to buy a lottery ticket hopefully win and move down to Florida and go shark hunting? Math makes the decision obvious I am afraid. Suppose you invest two dollars every day (roughly $62 a month) at a reasonable rate of 10% per annum then you will take almost exactly 50 years to accumulate close to $1m (actually about $920,000 but close enough) – so start saving now! To earn this same $1m in a big lottery like the National Lottery in the UK, you would have to match five numbers and a bonus ball; at odds of 2,330,635-to-1 in any one game I am told. So if you spend two dollars a day for 50 years you could enter 36,500 tickets and would have 1-in-63 chance of making those million dollars. This probability of 1:63 means the expected value from the investment over the 50 years is around $16,000 – against the expected vale of $1M dollars from the investment choice – no brainer isn’t it. However the concept of availability and the recency effect image of immediate winners enjoying extreme wealth subvert this rationality. What the crafty lottery companies do is parade in front of us some Joe who has just won a fortune and the next time we call in for gas or food at the Quickie Mart we have the faint glow in our memory that someone has just won the lottery so assume it occurs much more frequently than it does and it is our turn next. Well someone has to win surely and why not me? So we buy that ticket again and again only to tear it up with the forelorn hope of winning next time. 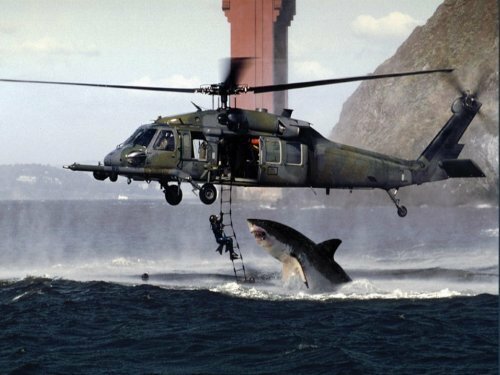 Here is a pic for how not to go shark fishing – I think this was off South Africa during a military training exercise.